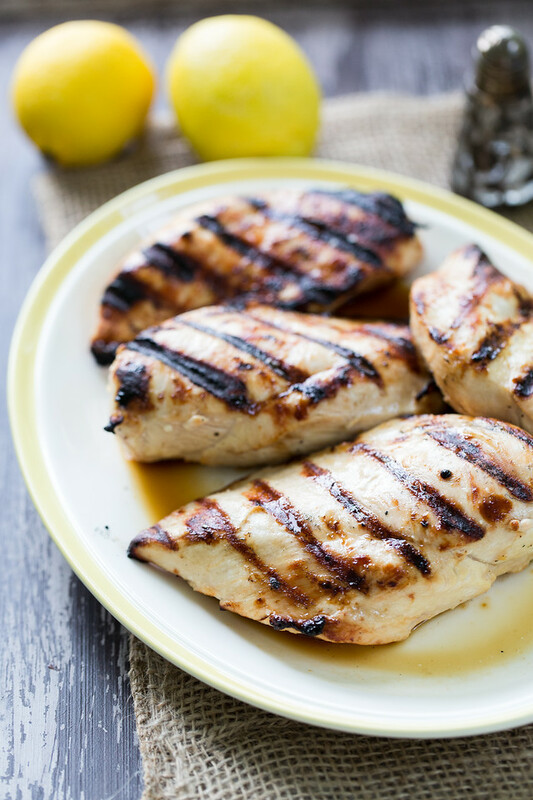 A simple marinade of lemon juice, olive oil and garlic make these lemon grilled chicken breast full of flavor, but is oh so easy! Perfect for easy weeknight grilling! A lot of people associate grilling with the weekend. It’s a leisure activity that stretches over a warm sunny afternoon. It doesn’t have to be. With this Lemon-Grilled Chicken Breasts – you can have a wonderful grilled dinner any night of the week! This is hardly a recipe, you simply marinate the chicken in one of the simplest marinades ever and it comes out so tender and moist and flavorful, you’ll be amazed! Last Sunday, I was looking for something easy to grill. Something that I could grill after my weekly wine tasting that wouldn’t require a lot of work or concentration – and I found it. Early in the day I made this Honey Mustard Broccoli Salad and let it chill in the fridge. I mixed up the marinade ingredients in a ziplock bag – just lemon juice, olive oil, and garlic and stored it in the fridge too. About 30 minutes before it was time to grill, I added 4 boneless, skinless chicken breasts to the ziploc bag and bag into the fridge it went. When it was time to grill, I pulled the chicken out of the marinade, salted and peppered both sides and grilled them quickly. They were moist and tender and tasted of lemon and garlic. Perfect! I realize for those of you without a gas grill, this might involve a little more work, but if you have a gas grill, this could easily be a weeknight dinner! I love these so much, we’ve already had them again! 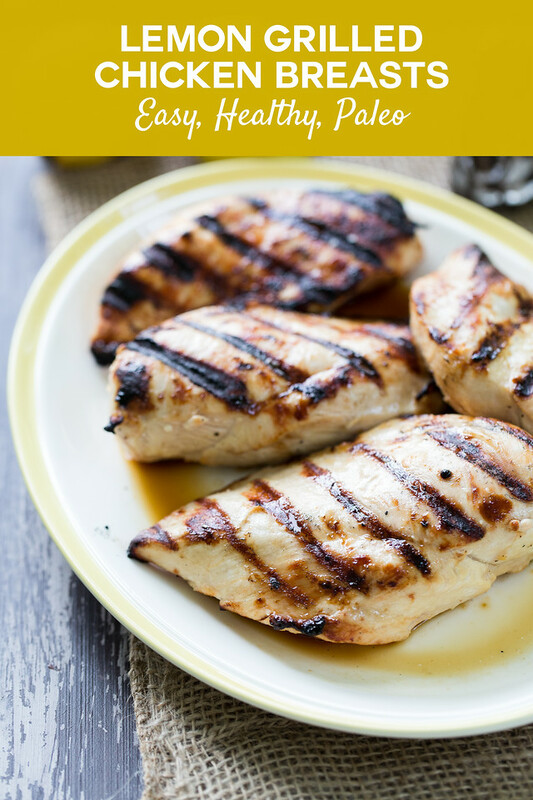 An easy lemon garlic marinade gives these Lemon Grilled Chicken Breasts plenty of flavor and keeps them moist! Place the lemon juice, olive oil, and garlic in a ziploc bag and add the chicken breasts. Seal and flip the bag around a few times to make sure all of the chicken is coated in some of the marinade. Place the bag in the refrigerator for 30 minutes. Preheat your grill to high. Remove the chicken from the marinade and salt and pepper both sides. Grill for 4 minutes on one side and then flip and grill for another 3-4 minutes or until chicken is cooked through. Some other easy grilling: Grilled Chicken with Corn and Black Bean Salsa, Peel and Eat Grilled Shrimp, and Grilled Kale with Strawberries. Lemon…my favorite! This is the perfect summer meal. Thank you so much for sharing your delicious recipe with all of us at Weekend Potluck, Pam! We hope to see you again this Friday, sharing more of your wonderful recipes. Thanks for having your linky party! Your post is featured on Full Plate Thursday this week and thanks so much for sharing it with us.We have pinned your post to our Features Board, Have a great week and come back to see us real soon! I can’t tolerate garlic so I use basil flavoured oil. Such a simple way to treat chicken and yet so mouth-wateringly delicious. These look like the perfect grilled chicken breasts! We just love the lemon flavor with grilled chicken, awesome! Thanks so much for sharing with Full Plate Thursday and hope to see you again soon. What a deliciously simple, but seriously delicious, marinade, Pam! I love recipes like this! Thank you for sharing with us at Hearth and Soul. Sharing! Looks delicious and I love your pictures! Thankyou for sharing on #HomeMattersParty. We hope to see you again next week. Sheesh! You are making me wish it was summer. That broccoli salad sounds delicious. The George Foreman Grill works for those of us without an outdoor grill. Broiling would be good, too. Lemon and garlic is a great flavor combination for chicken. I’ve discovered that I can make marinade, add my meat, seal it in a bag with my food sealer and drop it in the freezer. When I go to use it, the marinating is already done! Great for those of us who hate to pre-prepare.